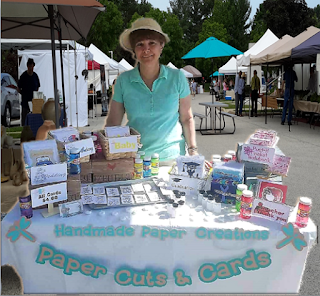 For the past few years I have had fun crafting cards and other paper creations for my family and friends. This year I decided to try my hand at sharing my talents, so I entered the Mother of Divine Providence Craft Fair and Bazaar. It was wonderful to see so many shoppers, and I had many opportunities to exchange ideas with other crafters. My daughter, checking out my handiwork. Every Vendor/Crafter donated an item to be raffled at the Bazaar. I donated this handcrafted Santa's Workshop. It featured a sleigh brimming with presents, Santa peeking out the front window, and elves could be seen hard at work through the windows on the sides. Ruth, a volunteer at the Bazaar, won my donation. My table featured 9 individually handcrafted cards. Each card was layered in color and accented with personality. I left the inside blank to allow for personalization. The 3 Gift Card Holders I made were unique and festive. It was a wonderful Bazaar and I have so many new ideas to make my next Bazaar even better!! A special "Thank You" to my mom, for all of her help!!! Please feel free to contact me if you are interested in having any special items made for your next occasion. I also have some wonderful ideas for party/shower/wedding favors, and I would love the opportunity to make your vision come alive.